February has been a month of mostly meals on my own. The Artist has been on numerous overseas trips, working in New Zealand and, as of this afternoon, Prague, so it’s just me. Not a bad thing at all. Indeed, I get to cook and eat whatever I please when I’m on my own. But I was starting to miss cooking for all of us. Because the Artist’s been here so irregularly it was decided that the Actor, 16, and the Musician, 13, would spend last Friday night with us, eager eaters that they both have become. There was a time when the Musician wouldn’t have contemplated eating a meal based on fish and potatoes – he is the only child I have EVER met who claims to loathe roasted potatoes (madness, I know). Fish would rarely knowingly pass his lips. He’s a Bolognaise boy from way back. But something (was it his bah mitzvah last year?) has changed both him and his eating habits. He is now more adventurous than I’d ever dared to hope. Both boys, it would seem, love good food. 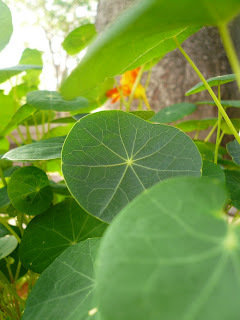 The peppery nasturtium plants in the back yard have finally begun to trail over the side of the wine barrel, a sure sign that they are ready to be picked and made into a salad, one with avocado and smoked salmon. Pizza, packed with potatoes, was the perfect choice for dinner. The fish: Take 4 handfuls of washed and dried baby spinach leaves and toss into a bowl. 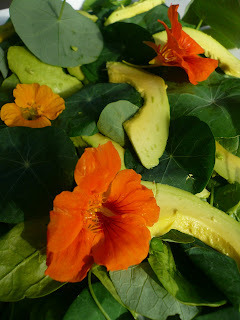 Next add 2 handfuls of freshly picked nasturtium leaves. Drizzle with walnut oil, about 2 tablespoons worth and about 1 teaspoon of white wine vinegar and a pinch of sea salt. Toss until the leaves are well coated and glossy. Seed, peel and slice 1 avocado and add this to the bowl, tossing very gently. Transfer to a shallow serving plate. Toast a small handful of walnuts in a dry pan until fragrant (about 5 minutes) and break with your fingers over the top of the salad. Tear some strips of smoked salmon and drape over the whole lot. Pick a few nasturtium flowers and set on top as a finishing touch. This worked really well, though the salmon wasn’t necessary, and it didn’t add anything special to the meal – I’ll leave it out next time. If you haven’t got nasturtium leaves, either omit them or use well picked watercress leaves – both are peppery and from the same botanical family. The potatoes: Homemade pizza is something special. Something that never, ever fails to impress. A potato-topped pizza is one step better. For the base, mix the flours together in a bowl. Add the salt, yeast, milk, olive oil and 250ml of warm water. Using you hands, bring the ingredients together until a dough starts to form. Place the dough on a lightly floured bench top and knead for 8-10 minutes (therapeutic work this bread making) then shape the dough into a ball. Place it in a lightly oiled bowl and rub the dough around to lightly coat it (this prevents a skin forming on the surface, one that would otherwise stop it rising properly). Cover with plastic wrap and set aside in a warm place for 30 minutes to rise. Bring the potatoes to the boil in salted water, reduce the heat and simmer for five minutes. Drain thoroughly and gently place in a very clean tea towel to absorb all the water – the potatoes need to be super-dry to work here. Set aside. Fry the onion slowly in the oil until soft and golden (about 25 minutes). Divide the risen dough into 4. Roll each piece out to a round of roughly 23cm (the more ‘rustic’ the shapes, the more charming the pizzas, so don’t be precious). Leave to rise on a baking tray in a warm place for about ten minutes. Evenly spread the onions over each base, followed by the potatoes, thyme, cheese and dot with yoghurt. 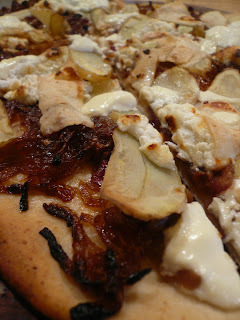 Drizzle with oil, top with parmesan shavings and bake in the oven for twenty minutes or so, until the bases are crisp. On Friday afternoon an old school friend of mine arrived in Melbourne for the weekend, someone I’ve known for a very long time. Our friendship was forged in 1985 during a rather heated debate about Duran Duran and Wham. As I said, it was a long time ago. Luckily we’ve both moved on in terms of both musical and fashion sense since then. Kylie was down here to farewell a friend of hers who is moving, following her heart, to Switzerland. So, as the visit was last minute and potentially frantic, lunch in the city somewhere was the best option. After a beautiful meal of crab and red mullet ravioli and a few glasses of very well chilled white wine, it was clear that neither of us could fit anything else in. So, it would seem, my Friday night fish and chips post would be, well, empty. But I had a little something up my sleeve, a meal I had cooked and wanted to share; it’s just that there was no photo. No matter – words alone will have to suffice. Instead, here are two unrelated photographs; a close-up of one of the artists paintings, the other of our cumquat tree. I love that tree. The fish: When the potatoes are well and truly ready, get your fish on the go – they will take only a moment or two of your attention. Over a high heat, quickly pan-fry King George Whiting fillets (or any thin, delicious white fish) in a little butter and grated orange zest. Cook for 2-3 minutes, skin side down. Flip over and cook for 1 minute longer. When nearly ready, douse with a good squeeze of orange juice and allow it all to bubble for another 30 seconds or so. Ready to go. The potatoes: A peasant dish, Spanish in origin, of slowly cooked potatoes and capsicums (bell peppers). It’s yet another example of how the humblest of ingredients can be elevated something magnificent with little effort. The Artist moaned with pleasure over these. So did I. The fish, so sweetly scented with orange, were a good accompaniment, but these potatoes are a meal in themselves. Fresh bay leaves really do make all the difference here. Or ‘Poor Man’s Potatoes’. All I can say is that things aren’t too bad if this is all you have to eat. Yes, that is a lot of olive oil and it’s not a misprint, but not all of it is eaten, rather it is drained away at the end. You can use it to fry onions (delicious) or anything else for that matter, just make sure that you put the oil in the fridge and use it within a couple of days. In a large, heavy-based frying pan with a lid, gently heat 5 tablespoons of the olive oil and add the finely sliced onion with a pinch of salt to release their juices. Cook on a low heat, stirring occasionally, for 20 minutes, until softened and translucent. Add the garlic, roughly chopped capsicums and bay leaves. Cook gently for another 15 minutes. Cut potatoes lengthwise, then cut each piece into 3 chunks and salt lightly. Add the rest of the olive oil to the pan and when it has heated up, add the potatoes and tomatoes. Leave to simmer for 20 minutes with the lid on, then remove the lid and continue to cook for another 20-30 minutes, by which time the potatoes will have cooked through completely when pierced with a skewer. When ready, drain much of the oil off the potatoes through a sieve into a jug. Just enough oil will be left to coat them, making them very beautiful and luscious indeed. The leftover oil is a boon – store it in a jar and fry onions in it when next making pasta sauce. It is richly flavoured and luscious. Loathe as I am to write posts about cute pets, let me just say this - the photo was an accident, but made me laugh for some time...back to food shortly. Most Fridays the focus is on the potatoes, the ‘chips’ part of the meal, the fish an accompaniment to the gloriously cooked spuds. I love potatoes. As a child I always wanted what we referred to as ‘cheesy potatoes’, a Gratin Dauphinoise though we didn't know that was it's name then... I would wolf down what was on my plate and try to secretly take seconds before anyone else noticed I was gone from the table. Fat chance! Somehow, there just never seemed to be enough! So nutritionists and carbohydrate-police be damned; potatoes are virtuous, sustaining and unmatchable. Just ask any Irishman. Nothing else comes close. But occasionally it’s the fish that takes centre stage. Like tonight. The potatoes – pebbly Jersey Royals from the self-proclaimed ‘Potato Man’(he must be an interesting super-hero, don’t you think?) at the market – are scrubbed, then steamed whole over a pan of simmering water. When tender at knife-point, they are removed to a bowl and gently broken up with a fork, crushed ever-so-slightly to reveal their steaming insides. While still hot they are bathed in lemon-infused olive oil, tossed and seasoned. Simple, but only worth doing if your potatoes are perfect and new, your olive oil magnificent. The fish - I always feel vaguely guilty about eating tuna. It’s like the beef of the sea with its huge, dense, fillets. And I know that it is not native to our waters in Australia, being reared in the dreaded fish farms off the South Australian coast. For us though, it is a once a year treat. The recipe is nicked, rather shamelessly I might add, from Jamie Oliver. Doubled, this would easily feed 4 or be enough to make a second meal the following night, tossed through pasta. Use a small pot that will fit the tuna snugly – too big and the tuna won’t poach properly. First, peel your tomatoes. Prick each one with the tip of a knife to pierce the skins, and place them in a heat-proof bowl. Pour a kettle of freshly boiled water over the tomatoes, wait for 40-60 seconds depending on their size, drain and pop into a bowl of cold water. When cool enough to handle, slip of their skins then carefully squeeze out their seeds. Make about 5 deep incisions in the tuna flesh on one side with a sharp knife point. Place a few leaves of rosemary, a sliver of garlic and a sliver of chilli in these incisions. The remainder will be used, so don’t be concerned about wastage. Put your well chosen pot on the heat and add a tablespoon or so of olive oil. Add the remaining garlic, rosemary and chilli along with the capers, anchovies, oregano and cinnamon stick and cook on a gentle heat until the garlic softens. Add the peeled tomatoes, tinned ones and bring to the boil. Lower the heat to a gentle simmer, breaking the tomatoes up with a wooden spoon. Season with salt and pepper then add your tuna, ensuring it is totally submerged. Pop the lid on partially and cook for 20-25 minutes. It will ‘flake’ easily when ready to eat. Remove the pot from the flame and allow to cool, lid on, to room temperature. Serve with the warm potatoes that you can cook and prepare during this cooling period. Sprinkle with parsley, chopped as roughly or finely as you like before serving. Oh-my-god-good. The children’s magazine I write for lost the new address. Bugger. A quick email, just checking what was happening, resulted in a piles picture books and novels arriving at my door and a panicked editor begging for my work with a 10 day deadline. Double bugger. I am up to my ears in books. Again. Being something of a Luddite, there are times when it is difficult to keep up with posting here, despite the fact that I have more inclination and time on my hands than ever before. Years of working as a bookseller meant that my world and working life were filled with, obviously, books. Computers were used for enquiries and sales; tracking returns and special orders. I didn’t have one in my home until the journey south and only got my first email address in 2001… I’m only just beginning to understand a little of the world of ‘puters. In truth, I still prefer writing and sketching in my Moleskin notebook, but having recently acquired a laptop of my own I feel compelled to use it! So, in an effort to keep myself posting, I have set myself a task, something most bloggers seem to do. Friday night is often Fish and Chips night at our house, though neither the fish nor chips are battered or deep-fried. It’s a traditional dish for many people and open to lots of interpretation and experimentation. More accurately, ours is Fish and Potatoes (any kind, done any way) a meal that seems a little celebratory, but is easy and luxurious. Each Friday I will try something different, posting the subsequent results here. Wish me luck.